I decided to get a head start on Easter (yesterday being the first day of Spring and all) this year by making little treat bags to hold goodies in the Easter baskets; because I wanted to buy big bag of candy and separate it instead of buying the more expensive individual packets every time. 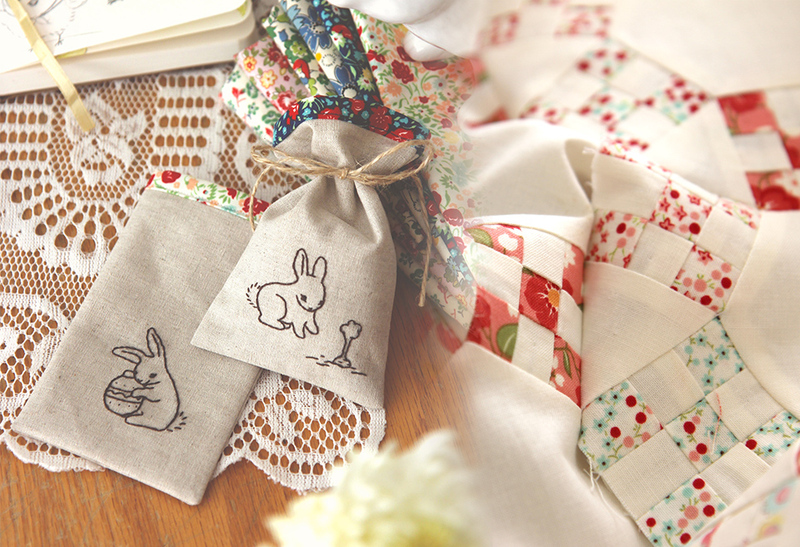 Then I saw nanaCompany's newly posted tutorial and got some inspiration (It's very cute and these bags are super easy to make, so go check out her stuff!). Perfect timing if you ask me! I ended up sketching out some bunnies & chicks of my own in my sketchbook. I cut into some of the new April Showers fabric I recently got and mixed it with some other florals from my stash. I mentioned in an earlier post that I had entered a 9-patch quilt contest at Quiltique. I did little ½" squares in the 9-patch, very tiny! Unfortunately, I didn't get any good pictures of the finished piece as I had to turn it in before 8 o'clock on the last day it was due and I was very rushed for time. I did appliqué some strawberries on the border. You can vote once in person on your favorite quilt until April 19th, 2014 at Quiltique. =) *crosses fingers* I do kind of wished they hung the smaller doll quilts lower instead of the top of the ceiling so other people could see them better though. :/ I (and my sons) had a hard time looking at the other quilts in the contest too because of the way everything was hung, and I don't need glasses yet! I'm just happy that I managed to get my piece in on time if anything, and can't wait to hang it up in the house when I get it back after the contest ends. I really like the spring feeling of the doll quilt though. It has an airy feeling to me. It'd be fun to make a larger version, maybe? So besides Easter, I've got relatives coming into town, Jude's 6th birthday, a family barbecue Spring Break, plus our 7 year anniversary to worry about. Eek, ton of work. I'm also trying to finish sewing up curtains for eight windows too before the family gets here. ^_^; I think I need a bath to regenerate. I'm sure after April blows over I'll be found hidden in some corner with a book, blanket, tea, and treats of some kind.